Note: This post was written and submitted by NUMBERROCK. We thank them for sharing their product with us. NUMBEROCK is an ongoing project producing free educational songs and music videos for kids. It was started by an innovative 5th Grade teacher who envisioned a new kind of classroom where students got energized for math and where high levels of engagement drove facilitated mastery while unburdening the teacher's role in classroom management. While using these songs, videos, worksheets, and interactive lesson materials in his own classroom math centers, it became clear that students responded positively and were more motivated to tackle the various math concepts behind the music. Parents of his students even noticed their children singing math songs around the dinner table well beyond school hours. Math lessons were making it out of the classroom! Seeing his students so enthusiastic when it was time for math was welcome, to say the least! But the epiphanous moment was when students were singing math songs in class all-day long like they were in the American Top 40! Each of these rhythmic music videos are currently targeted at students from 2nd-5th grade. Each song can be enjoyed free-of-charge on YouTube at the following link: click here . We cordially invite you to browse through the full library and hope you'll find that the songs lighthearted, instructional, or just plain awesome. To provide educators practical resources that transform student learning. 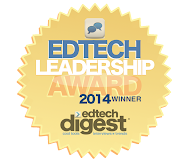 2014 EdTech Digest Leadership Winner! Please follow this blog @ccedtech, and follow authors Karen Larson @karen_larson and Gene Tognetti @gtognetti1. Thanks! Balefire labs - find educational apps to augment learning! Top July Posts - Chromebooks, Balefire Labs, Back to school & more! Picture Window theme. Theme images by zbindere. Powered by Blogger.